A court in Egypt has banned "all activities" by the Muslim Brotherhood. The Cairo Court for Urgent Matters said the ruling applied to the Islamist movement, its non-governmental organisation and any affiliated groups. It also ordered the interim government to seize the Brotherhood's funds and form a panel to administer its frozen assets until any appeal had been heard. 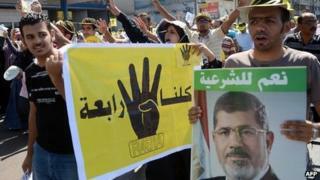 The military authorities have launched a crackdown on the group since ousting President Mohammed Morsi on 3 July. Dozens of senior figures, including its general guide Mohammed Badie, have been detained on suspicion of inciting violence and murder. Hundreds of people demanding Mr Morsi's reinstatement, most of them Brotherhood members, have also been killed in clashes with security forces, who portray the crackdown as a struggle against "terrorism". The 85-year-old Islamist movement was banned by Egypt's military rulers in 1954, but registered an NGO called the Muslim Brotherhood Association in March in response to a court case bought by opponents who contested its legal status. The ban on the Muslim Brotherhood's activities is far more comprehensive than expected, but it shouldn't come as a surprise. Since President Morsi's ousting, the group's days have been numbered. This is an organisation that has seen the most dramatic fall from power thanks to an outpouring of popular discontent, and military intervention. For a year, the Brotherhood's leaders were in charge, now most of them are in jail. Today's ruling bans all the Brotherhood's "affiliated institutions", but it is not clear how that will affect the groups social services, including charities and hospitals. For a long time they were kept at arm's length, but were brought closer when President Morsi came to power. But the court ruling indicates that all of the group's frozen assets will be administered by a government panel. The Brotherhood's political wing, the Freedom and Justice Party, may be unaffected by the ruling, but it faces a separate challenge - amendments to the 2012 constitution ban political parties that have religious links. The Brotherhood also has a legally registered political wing, the Freedom and Justice Party (FJP), which was set up in 2011 as a "non-theocratic" group after the uprising that forced President Hosni Mubarak from power. Following Mr Morsi's overthrow and the suspension of the Islamist-friendly 2012 constitution, the Cairo administrative court and the social solidarity ministry were tasked with reviewing the Brotherhood's legal status. Monday's ruling by the Cairo Court for Urgent Matters bans the Brotherhood itself, the NGO, as well as "any institution derived from or belonging to the Brotherhood" or "receiving financial support from it". It is not clear if it applies to the charities and social services linked to the Brotherhood, including schools and hospitals. A leading Brotherhood member, Ibrahim Mounir, described the ruling as a "totalitarian decision" but insisted the group would not disappear. "It will remain with God's help, not by the orders by the judiciary of al-Sisi,'' he told al-Jazeera Mubashir Misr TV, referring to the head of the armed forces Gen Abdul Fattah al-Sisi. The court did not reveal the grounds for the ruling, but it was prompted by a lawsuit filed by the leftist National Progressive Unionist Party, also known as Tagammu, which accused the Brotherhood of being "terrorist" and "exploiting religion in political slogans". Earlier this month, a judicial panel issued a non-binding recommendation to an administrative court supporting one legal challenge, which argued that the NGO registration was illegal because the Brotherhood-led government had effectively issued a licence to itself. Social Solidarity Minister Ahmed al-Borai is also reported to have decided separately to dissolve the Brotherhood's NGO. He told Dream TV on Saturday that he would soon publish a statement outlining his reasons.